At Durabuilt, you aren’t just getting a beautifully designed product, but one that is built to the highest standard. We are confident in the products we manufacture, and our warranties help us ensure that you are, too. Skilled labour required to replace or repair any hardware, glass sealed unit or other window component as specified within the Durabuilt Original Consumer Warranty is provided for two years. This coverage includes skilled labour required to replace or repair any defective product, product component or defect in workmanship from the initial installation date, warranty is provided for five years. Please refer to original warranty for more details. Durabuilt provides a 20 year limited warranty on all glass sealed units from the date of manufacture on all window systems. Durabuilt’s clear glass sealed unit is warranted on a pro-rated basis, subject to the exclusions outlined in our Original Consumer Warranty, that the air seal of such insulated glass units will not fail due to defects in material and workmanship. Durabuilt provides a limited warranty of ten years from the date of manufacture against extruded paint and coatings on all PVC Window Systems as well our PVC cladding and brickmould. Durabuilt White and Beige extruded vinyl products (core frame and structure of our window systems) will be free from significant discoloration, warping, pitting, and blistering for the lifetime of the product under normal circumstances, use and conditions. Durabuilt provides a limited warranty of ten years from the date of manufacture against paint and coatings of our aluminum Hybridex and Tri-Bridex Window Systems as well as aluminum cladding and brickmounld used in our window products. Our interior wood framed window (Tri-Bridex Series) as well as any other wood frame components will be protected against defects such as holes, blistering and cracking for three years from the date of manufacture. A limited lifetime warranty is provided for all operating hardware, cranks, handles and locking mechanisms against defects in materials and workmanship. All warranty is limited to the replacement value of the defective hardware. Skilled labour required to replace or repair any hardware, glass sealed unit or other door component as specified within the Durabuilt Original Consumer Warranty is provided for two years. 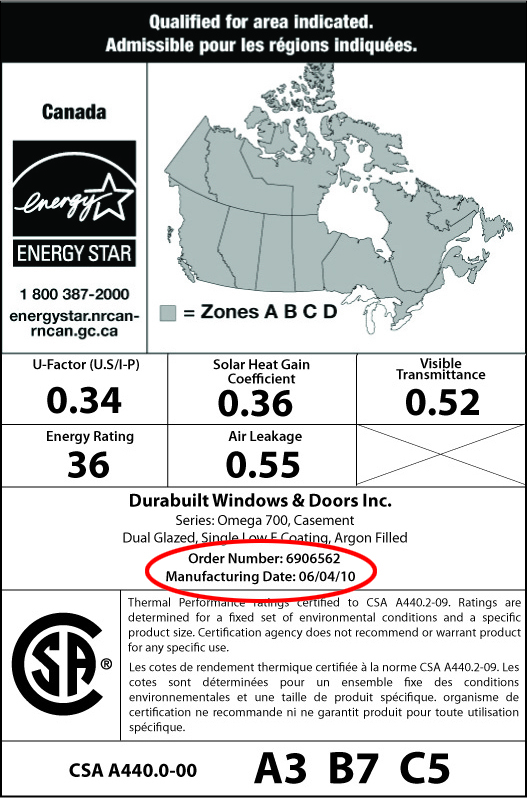 Durabuilt provides a limited warranty of ten years on all door glass sealed units from the date of manufacture (including decorative doorlites; raise/lower blinds and shades; clear and obscure glass; doorlites with grilles). 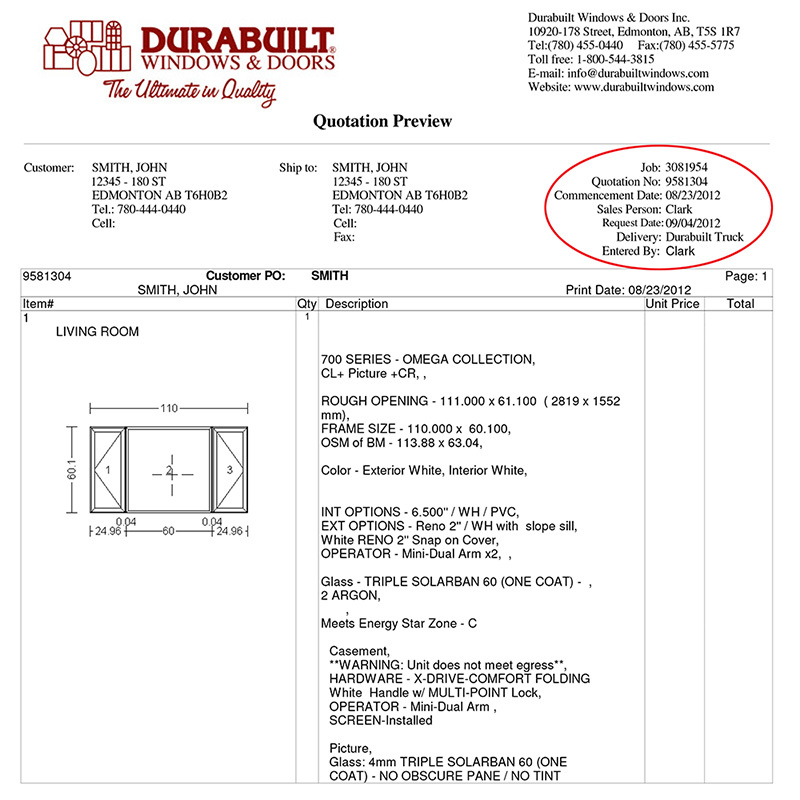 Durabuilt’s sealed unit is warranted on a pro-rated basis, subject to the exclusions outlined in our Original Consumer Warranty, that the air seal of such insulated glass units will not fail due to defects in material and workmanship. Our interior wood-PVC clad patio door system and all entry door jamb and wood frame components will be protected against defects such as holes, blistering and cracking for two years from the date of manufacture. For a period of five years from the date of manufacture, Durabuilt warrants that all Door Hardware shall remain in good operational condition. This coverage pertains to all entry door, garden and sliding patio door systems. Durabuilt’s Dura-Smooth Fibreglass, Woodgrain Fibreglass and Classic-Craft® Doors are guaranteed to be free of defects in material and workmanship that might unreasonably affect their performance. Durabuilt provides a limited warranty of five years on our Premium Steel entry door systems from the date of manufacture against excess warpage in the plane of the door and bow or misalignment of the frame or jamb in which the door has been hung. Durabuilt warrants all sliding patio door systems (including our PVC & Hybrid Doors) against defects in material and workmanship for a period of 20 years, beginning from the date of manufacture. This option is available only for single stand alone family, transferability of the warranty can be only exercised one time, claimant must have purchased the house from original owner (customer), they must retain the original proof of purchase to be entitled in order to claim the warranty, the warranty in such a case will be honoured only to a maximum of 10 years from the original date mentioned on the proof of purchase, provided that the owner is living in the single family residence. All warranties are subject to the conditions, terms and limitations set out in the Durabuilt Windows & Doors Inc. Original Consumer Warranty. Not only are Durabuilt windows and doors directly manufactured in western Canada, they are also locally serviced. We pride ourselves on quality craftsmanship and design, but if you do experience a problem, we’ll be sure to correct the issue quickly and professionally. Please note that service work that falls outside of the parameters of our product or labor warranty may be billed directly to the consumer. All chargeable work will be quoted on a case-by-case basis.